during Fr. 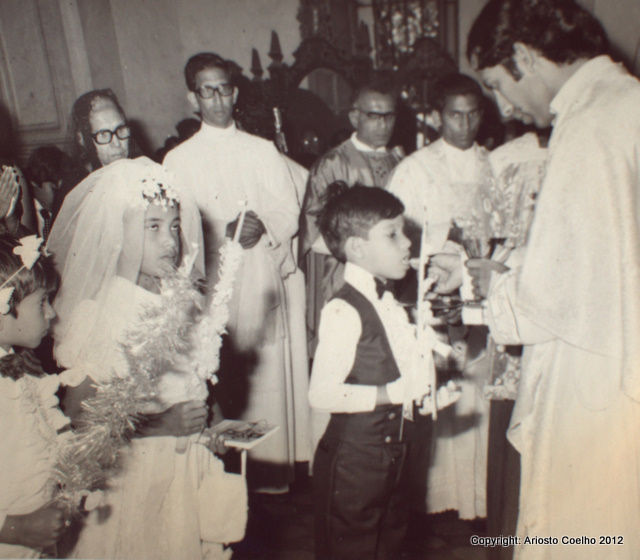 Coelho’s First Mass in Navelim Goa, India, 1977-12-21.
donation "My Sacramental Services offer solely intangible religious or spiritual benefits. I do not, on principle, maintain fees for these. Financial donations are welcomed so that I may sustain and further my ministry, meet my temporal needs and do works of mercy on behalf of the less privileged, especially in India. If you should desire a tax deductible acknowledgement, please make your check payable to the White Robed Monks of St. Benedict [WRB]. THANKS!" Fr. Ariosto Coelho For more details please call 650-952-9456.
who participated with me in various rituals and events all over the world.